Work Conditioning is an individualized rehabilitation program designed to prepare the injured worker for returning to work. 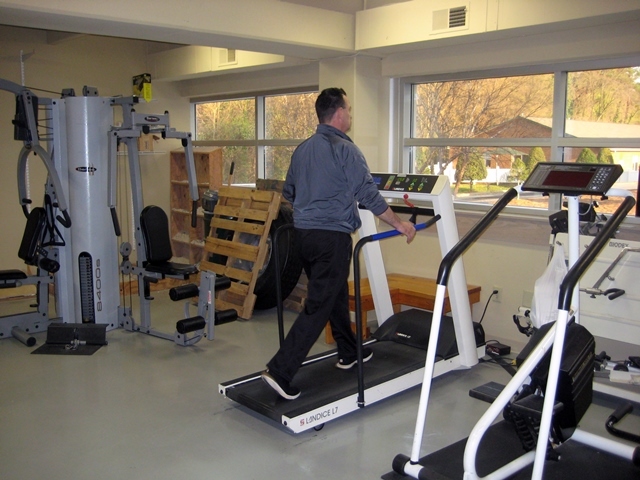 This program has been developed as a second step in the rehabilitation process. The work conditioning program is seen as a follow-up to a chronic or acute rehabilitation program and it is coordinated with such programs as the patient progresses from a hands-on treatment approach to an independent strengthening and conditioning program. Our work conditioning program is designed to provide the strengthening, conditioning, body mechanics education and job simulation necessary to enable the worker to progress to the point of returning to work or to be as physically fit as possible to begin vocational rehabilitation. How long can I expect to be in the Work Conditioning Program? A work conditioning program typically last between 2-6 weeks. This time can vary depending upon the physical demand level of the job and/or how quickly the patient can reach their work goals. A work conditioning patient is seen 2-5 times per week for 1-4 hours per day depending on physician referral and patient progress. What are my responsibilities as a Work Conditioning patient? Give your best efforts to the program. Keep discussion open with your work conditioning specialist: what’s working, where you are having difficulties. Follow the program prescribed by the work conditioning specialist both at the clinic and at home. Work with your work conditioning specialist to find ways that you can control your symptoms. Is to return the injured worker to gainful employment as safely and efficiently as possible. We achieve this goal through direct communication with referring physicians, case managers, insurance adjusters and patient to ensure that all parties are working toward the same goal of efficient case resolution.